Nako is a small village high in the upper Himalayas blessed with views so enchanting and breath taking that it will take some time for you to realize how far you have come from civilization and how mesmerizing the Himalayas are. And if you are city dweller like me I can guarantee that you’d go bonkers gaping at the mountains and the triptonic 360-degree views, which are bountiful in Nako. Pictures speak a thousand words or so I believe. See some of the views that will make you want to pack your bags and hop to Nako. Nako is a tiny village in the Kinnaur district of Himachal Pradesh and lies at a height of 3600 meters (around 12,000 ft.) in the restricted zone along the Indo Tibet border. Inner line permit is required for foreign nationals but Indians don’t need one. It lies on the road that goes towards the heavenly Spiti valley from Kinnaur district. The rustic and more or less dry mountains ranges starts from here onwards and merges with Spiti valley up ahead. This small village is insanely beautiful with views of snow capped Himalayas all around and a small lake in the center of the village called Nako Lake. It’s a small lake, which freezes over in winters, and I have heard that its used for playing cricket by the kids in the village. This is a high altitude lake surrounded by poplar and willow trees and a cemented walking area around the lake is being constructed. The best part about this walking area is that you can come here at nighttime, just sit down and see the millions of stars twinkling in the lake below and in the sky above you. You’d feel as if you can just reach out and touch the sparkling stars. For the unhurried hippies who like to blend in, soak in and really feel the place before heading out, there are walks around the village, which one can take. There is also a 4-5 hour trek to another small village called Tashigang. This trek starts from behind the lake up the mountain right behind the nako village and is loaded with ecstatic views. The eastern side of the range borders Tibet and if the laws permitted anyone can reach Tibet from here in few days of hiking. Usually people don’t venture out this far out and up high in the Himalayas to just see Nako and most of the time they venture up ahead towards Spiti valley. All backpackers first reach Shimla and then travel up ahead on the erstwhile silk route towards Kalpa in Kinnaur district. 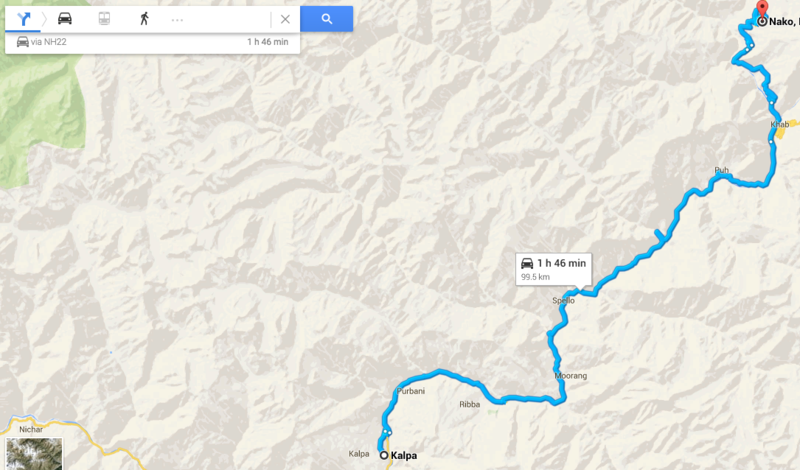 There are numerous options available from Kalpa, Shimla or Rampur to reach Nako. Most the people come in hired taxi from the plains or their own cars/bikes. Himachal Road Transport buses are also available but the frequency wouldn’t be too great and you would have to ask locals for the bus timings. From Kalpa the distance to Nako is around 100 kms and it would take at least 4-5 hours to cover this distance as these are high mountain passes where 100 kms is not the same as in the plains and it takes time to cover distances. There are few guesthouses with names like Galaxy and Lavon. There are tents also available on rent by Kinner camps. In addition to these 4-5 locations there are home stays also available. This is a new trend and slowly the local people are able to earn a living by letting houses for home stay and running small dhabas and internet cafes. As the norm is in the Himalayas local people are peaceful and quite helpful. Lately there has been construction going on and soon I think this place will have all facilities like the ones found in the lower Himalayas and the plains.